Miss Hotness Alejandra got a phone call from her godmother, she was making a huge family reunion. Let me give you a head-start, Alejandra’s family has a Mexican heritage. It is without saying that her family is really big, in total they have like 40 people altogether! Anyways, the gang got invited to San Antonio, Texas. We made our plans and discovered that they were going to celebrate the 175th Anniversary of the Alamo, so it was a big thing up there. We book our airline ticket. As usual, we found a great price on Dollar Car Rental at $258.29, which is about $51.66 per each one of us. After the flight, her family was there waiting for Alejandra, and boy! What a surprise it was to see like 10 people there…everyone was giving kisses and hugs, well, what can we say latin families tend to be very in a kissing spree! Even the granma was there, we all were laughing cause Miss Hotness was Miss Blushing, which was a first for us. Finally, we got into her house here in San Antonio, and then it was the parade of brothers, sisters, aunts, uncles and the cousins…Mike, Jane, Simon and me were swamped with names and people that at the end we were confused who was who, which was pretty amusing. The next day Alejandra and us got into our SUV and headed to the Alamo, which was a Spanish mission. People used this place as their home, setup the first hospital in Texas. 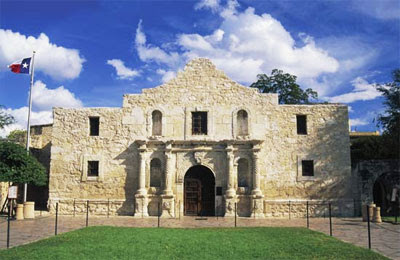 Then after the Texas Revolution, Texians and Tejanos make it as their own home. One of the pieces of legend is that the army of Santa Anna came and the people at the Alamo stood there defending it for 13 days. Colonel Travis made a line and asked who was willing to stay and fight to cross the line, everyone except one crossed it. One name that stood was David Crockett who was a famed frontier-man, but there was also a renowned knife fighter named Jim Bowie, with that last name we all said that perhaps is David Bowie’s lost granpa’!